This is an insulated adapter or distance piece, made from PVC. 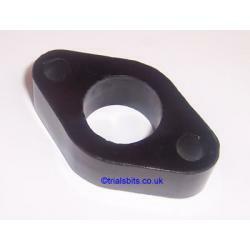 A replacement for the original Bakelite item originally fitted to some Matchless models, it can be used for many applications. It has a thickness of 3/4 inch, and has an internal diameter of approx 26mm, so it is too small for use with 900 series MK1 Amals..